Our new website has finally been launched. Hope you like it! The style of the site is very similar to our sister site at www.start-services.co.uk (which focuses on our IT Audit and Due Diligence services) - do take a look if you haven't already. Start Software is delighted to announce that it has successfully renewed the prestigious ISO 9001:2000 and Accredit UK awards. These standards recognize the quality and capability of the organization. 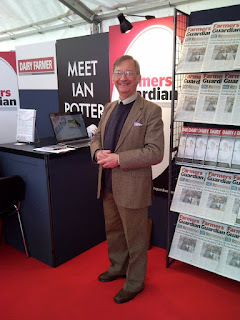 Peter Allen, a client and leading dairy consultant, launched Total Diet Management v3 at the Dairy Event 2009 show today. We have been working closely with Peter for a few months to redevelop Total Diet Management (TDM) to make it easier to use and more sophisticated in approach. TDM analyses cows' diets and the value of the milk produced in order that a dairy farmer can maximise his profit margins. For more information about TDM, contact Peter directly on 01939 270788 or by email: peter@totaldietmanagement.co.uk. Just got back from holiday to hear that our ISO 9001 annual review has been successful. All of Kim's hard work has been rewarded with a straightforward review visit from our assessor and a report with only minor queries and suggestions. Following on from our AccredIT successful re-accreditation, this is great news for us at Start.